US Secretary of State Mike Pompeo says there is a "real opportunity" for a deal when President Trump meets the North Korean leader Kim Jong-un. Interviewed by ABC News, he said North Korea must take "irreversible" steps to get rid of its nuclear arms programme. Mr Pompeo met Mr Kim secretly in Pyongyang earlier this month as CIA director. Details only emerged later. Mr Trump is expected to meet the North Korean leader next month to discuss denuclearising the Korean peninsula. Mr Pompeo said Mr Trump had clearly told him to raise the issue of a verifiable mechanism to make sure North Korea does denuclearise. He also raised the topic of US citizens held by the North Koreans. Separately, new US National Security Advisor John Bolton told Fox News that an agreement with Libya on eliminating its weapons of mass destruction programme could serve as a model for a North Korea deal. Libyan leader Muammar Gaddafi agreed with Western powers in 2003 to dismantle his programme in return for the lifting of sanctions. "There are obviously differences. The Libyan programme was much smaller, but that was basically the agreement that we made," Mr Bolton said. What has been happening on the ground? 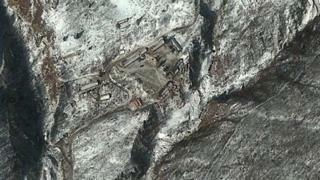 South Korea has said that North Korea's main nuclear testing site - Punggye-ri - is to close. Presidential spokesman Yoon Young-chan said that Mr Kim had stated he "would carry out the closing of the nuclear test site in May". Experts from South Korea and the US would be invited to witness it. North Korea has so far made no public comments on the issue. Chinese scientists have said the site may have partially collapsed last September. On Friday, Mr Kim and South Korea's President Moon Jae-in agreed at an historic summit to work on denuclearisation. The meeting followed months of warlike rhetoric from the North. Will Korea talks lead to lasting peace? Situated in mountainous terrain in the north-east, it is thought to be the North's main nuclear facility. After the last, in September 2017, a series of aftershocks hit the site, which seismologists believe collapsed part of the mountain's interior. Mr Kim made an apparent reference to these reports, according to South Korea's Yonhap news agency. 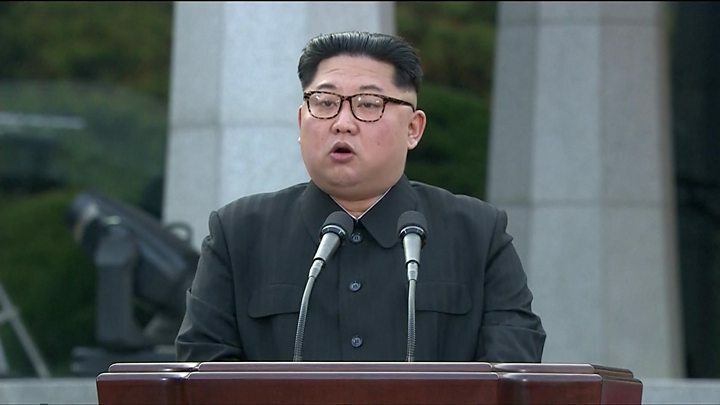 "Some say that we are terminating facilities that are not functioning, but you will see that they are in good condition," the North Korean leader was quoted as saying by Mr Yoon on Sunday. This is another significant and symbolic step by Kim Jong-un. He had already announced he'd be closing the Punggye-ri test site, but now he has told officials in South Korea that he's prepared to make it public and invite experts and media from Seoul and the US to inspect it. Mr Kim also told President Moon that he hoped trust could be built with the US and reiterated that there would be no need for him to have nuclear weapons if they formally ended the war on the Korean peninsula. Mr Kim said once Washington spoke to him North Korea would know he was not an aggressor. He added that his heart was broken when he saw the two clocks with different Korean time zones hanging on the wall of the peace house at the border between the two countries. He will now match the time zone in the North with that of the South. What else was agreed at the inter-Korean summit? Mr Kim and Mr Moon said they would pursue talks with the US and China to formally end the Korean War, which ended in 1953 with a truce, not total peace. The commitment to denuclearisation does not explicitly refer to North Korea halting its nuclear activities but rather to the aim of "a nuclear-free Korean peninsula". The statement talks about this taking place in a phased manner, but does not include further details. Many analysts remain sceptical about the North's apparent enthusiasm for engagement. Previous inter-Korean agreements have been abandoned after the North resorted to nuclear and missile tests and the South elected more conservative presidents. Korean meeting: How did we get here?